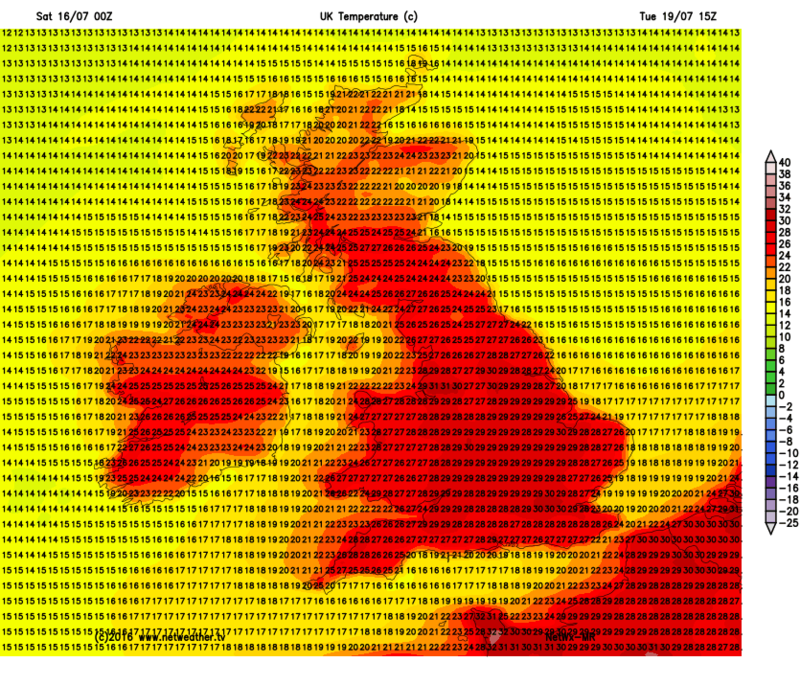 I don't want to put a spanner in the works but Tuesday looks increasingly hot! Hot air surging north from the Sahara. 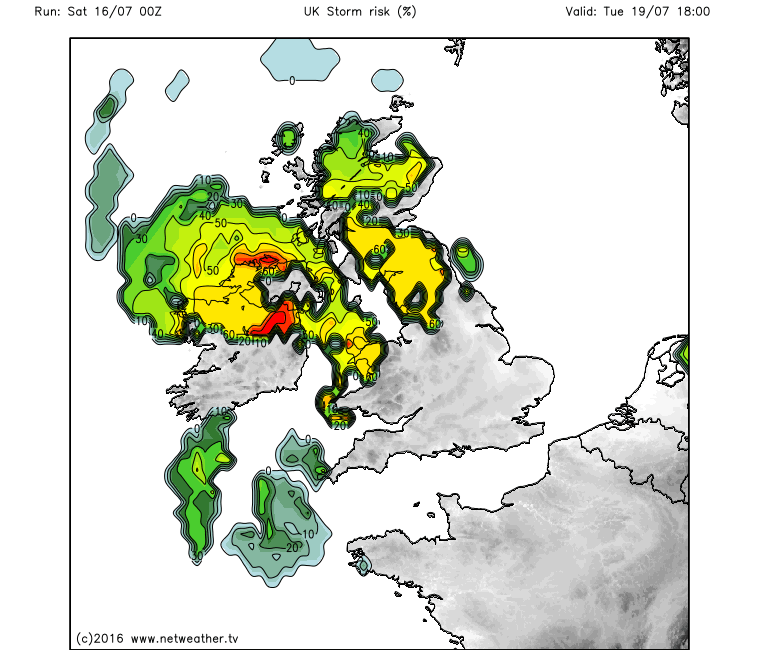 Wednesday could go out with a bang with some vicious thunderstorms. 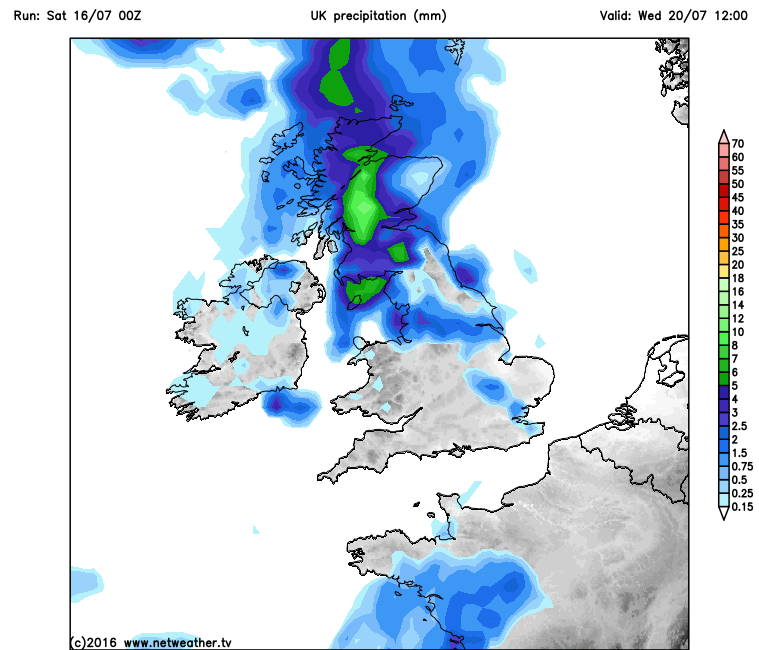 I would love it to be right but I think I recall it showing 40C+ on some of its runs last year actually, certainly there was one model doing this and I think it was NAVGEM. The delaying of a breakdown is far from uncommon, but then again the speeding up of one is common too. Unfortunately the best of the uppers look to be coming overnight. 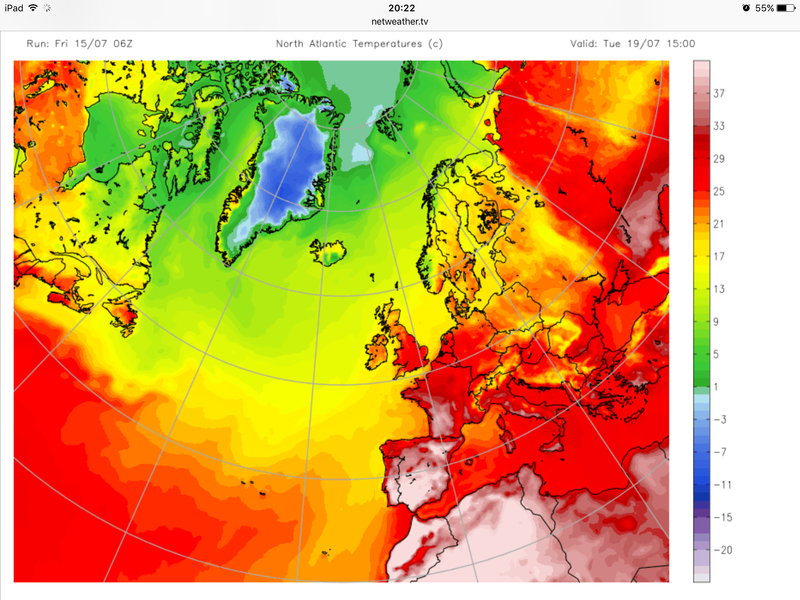 Still, just a few days ago next week was supposed to be "back to normal", so plenty for sun lovers to be grateful for! 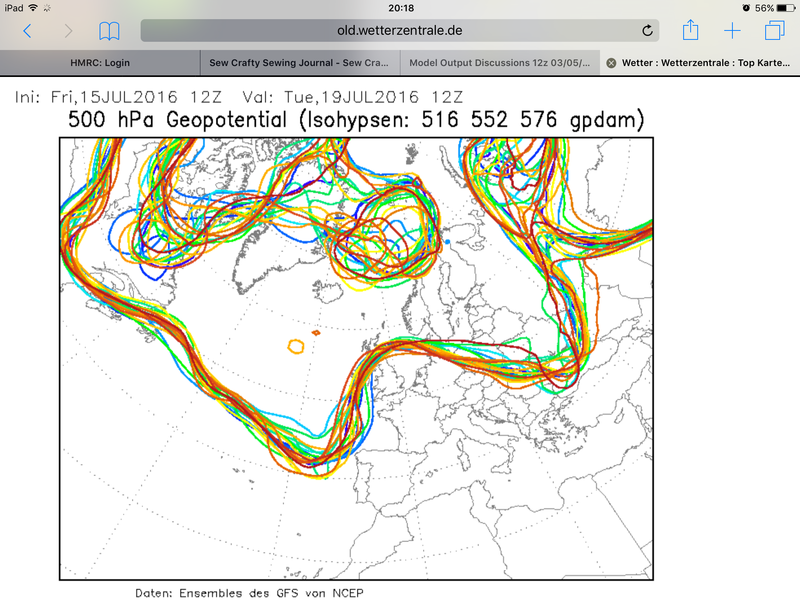 Looking at the GEFS in a bit more detail - two clear alternatives come up by D10. The first option (example below) is a stalled low either over us or just to the east, with high pressure generally building north through the Atlantic. 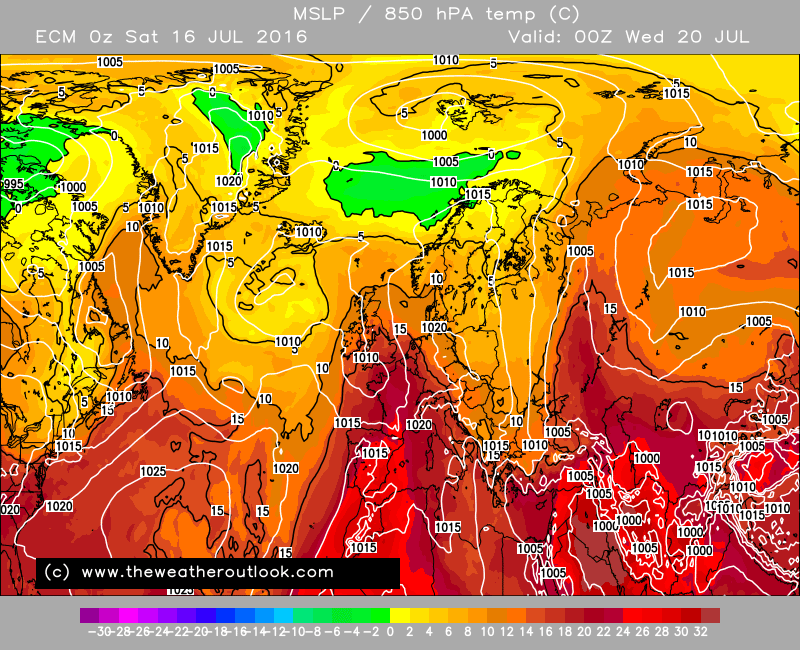 The result will be a northerly influence, cool and less settled, particularly in the east.  11 members follow this theme in some way. Therefore, it's not a good evening to consider the GEFS mean as representative. With such an even split of runs going distinctly one way or another, the GEFS mean simply flattens everything out, which betrays the fact almost all of the ensemble members have much more amplification wither in one part of the north Atlantic or another. 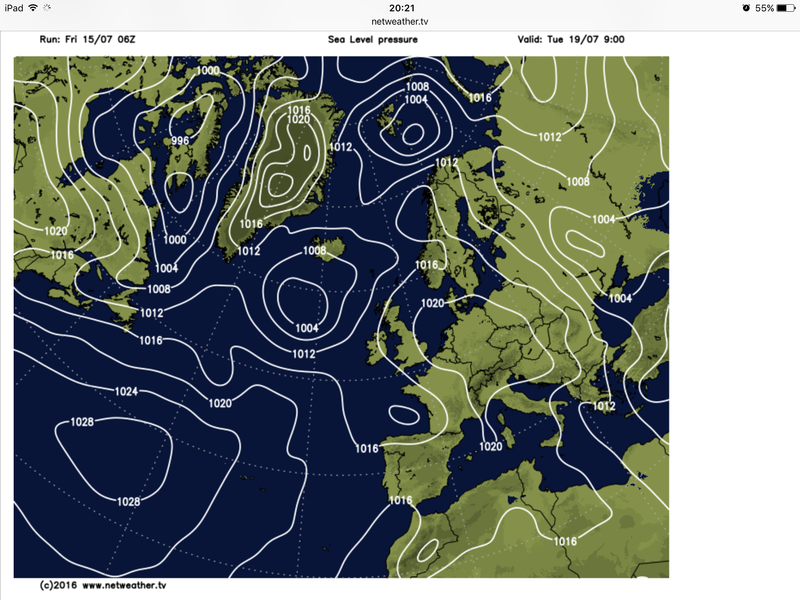 For the unsettled one at D10, the trough has now cleared and high pressure is building back in. But the "settled" member at D10 now finally succumbs to the trough. Lots of the members copy a version of these runs in their evolution. What does this tell me? 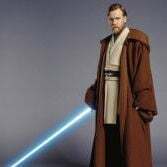 Probably this. The D8-D14 period may end up "averagish" on the whole. 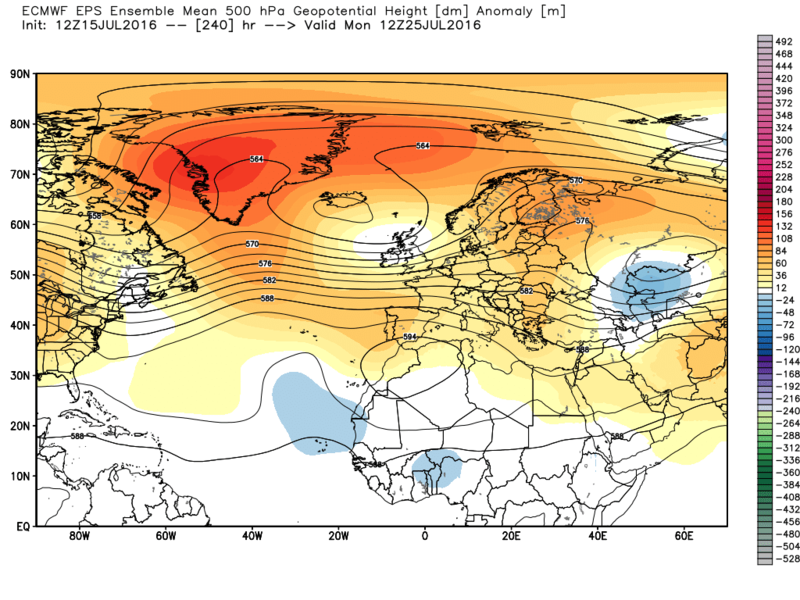 But these ensembles tell me we're not likely to see average weather on each day. Rather, we'll probably see some very good days and some very poor days. Maybe I'm stating the absolute obvious here(! ), but I think this is an important point to make, especially as some on here may confuse people's forecasts of "average weather" with "no good/bad weather at all". 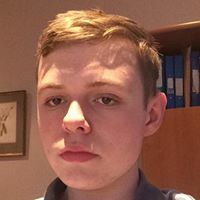 Good old navgem! 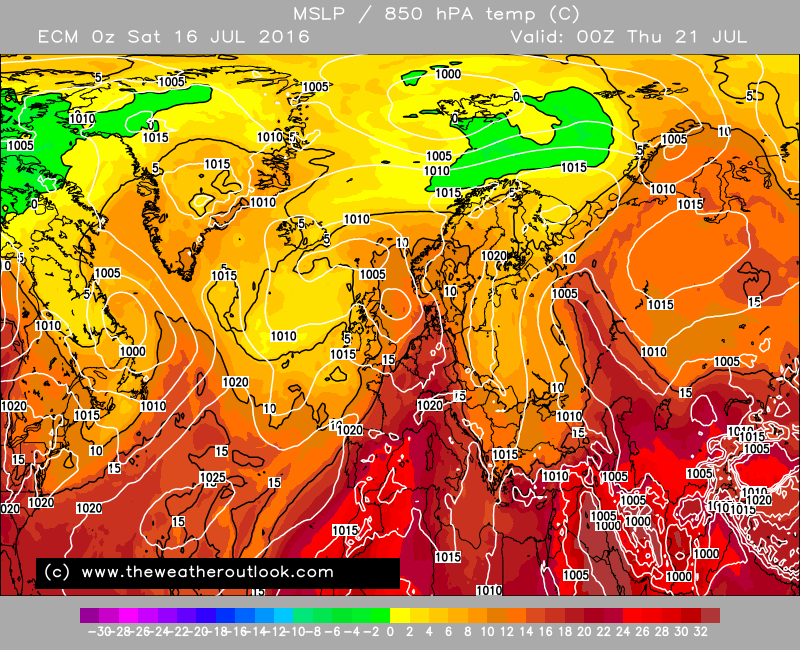 34c seems well overdone to me though this time....I think an isolated 30c will be about as good as we get. Not to be sniffed at in this rotten summer! 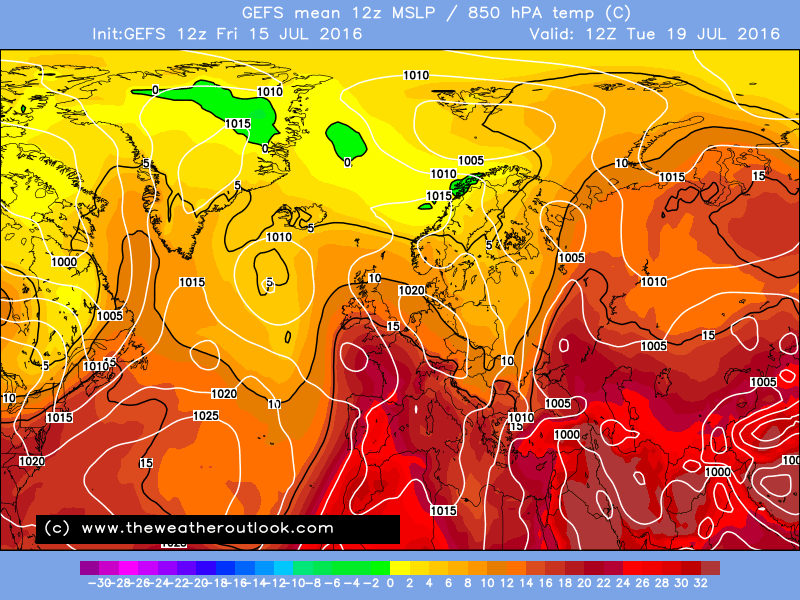 The GEFS 12z mean looks excellent through the first half of next week for those of us fed up with this cool cloudy summer..hopefully it won't be long before it looks as good again! 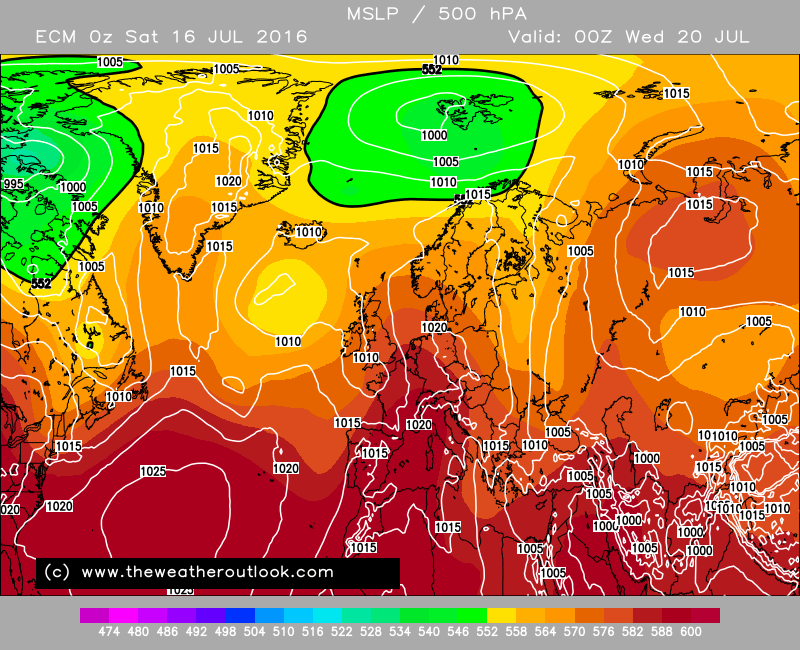 Certainly possible should there be some unbroken sunshine under the highest uppers. Wind direction is favourable too for the usual hotspots. I'd go for a high 33 maybe 34 at somewhere like Northolt or Heathrow area. 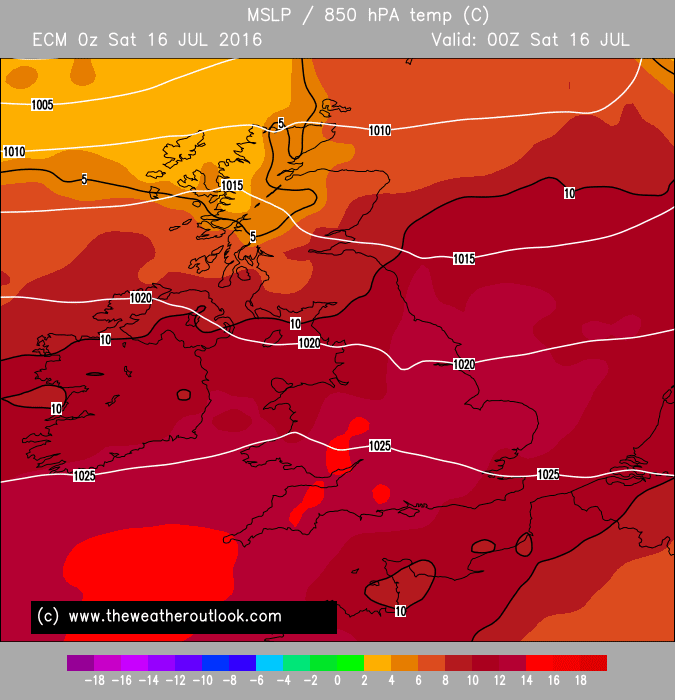 Lovely looking Ecm12z ens mean up to and including next midweek, following a warm and largely fine weekend in the south with temps into the mid 20's celsius, early next week becomes very warm or hot and increasingly humid from the south with spells of sunshine but an increasing chance of heavy showers and thunderstorms, even the north becomes warmer.We should see parts of the south hitting 30-31c on Tuesday and still into the mid to high 20's c on wednesday further south / southeast. 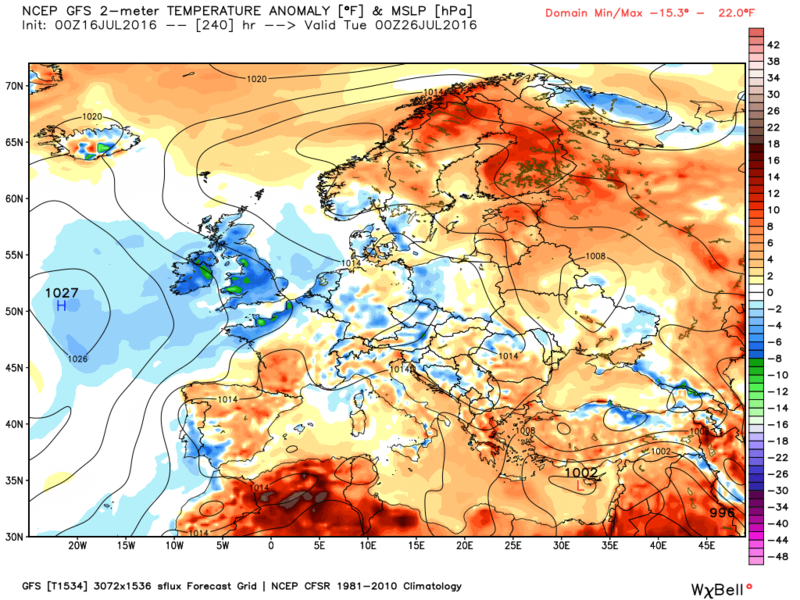 Looking further ahead, although we lose the very warm uppers, it still looks on the warm side with sunshine and thundery showers with temps around the low 20's c.
The ecm and NOAA anomalies are in fair agreement in the 6-10 range this evening. 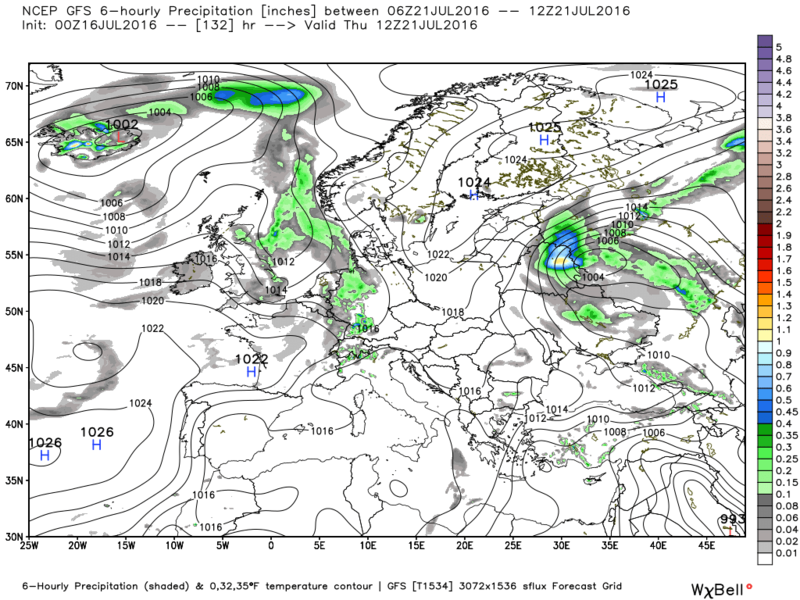 Azores HP pushing north in mid Atlantic, positive heights Greenland and a weak trough north of the UK. 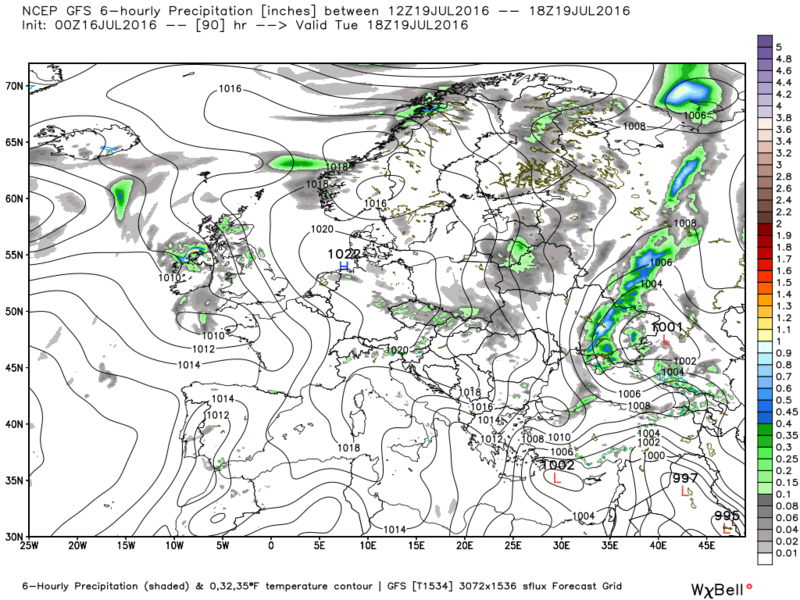 Looking at the 850mb chart this essentially means a trough to the north west moving east to north of the UK veering the upper flow NW. 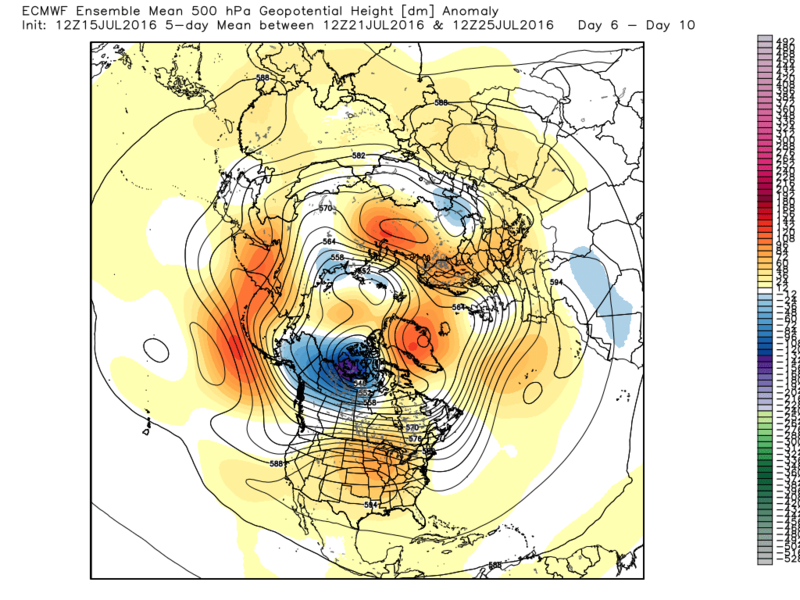 Ergo the tendency for a N/S split continues after the middle of next week. In the 10-15 period perhaps some more amplification and with the trough becoming more influential temps falling below average. Today a weak front lying across the country from N. Wales splitting the country in two. Warm and humid south of the front and much cooler north. From Sunday becoming increasingly warmer culminating on Tuesday, as a shallow low drifts in from the south west, with temps around 28C in England and even the possibility of the odd place touching 30C Possibility of storms Tuesday running into Wednesday The low quickly moves away allowing cooler air from the west which actually becomes quite cool by the ten day period but that will keep I think. Bring on the spanish plume! 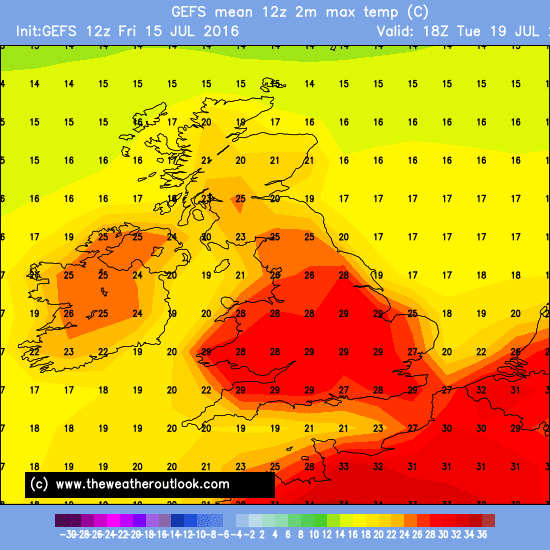 Temps set to soar early next week and even this weekend the south will be up to 25/26/27c in any decent sunshine but the first half of next week draws increasing warmth / heat and humidity northwards from France / Spain up across the UK with 30/32c in the south, the gfs is currently under playing the maxima. 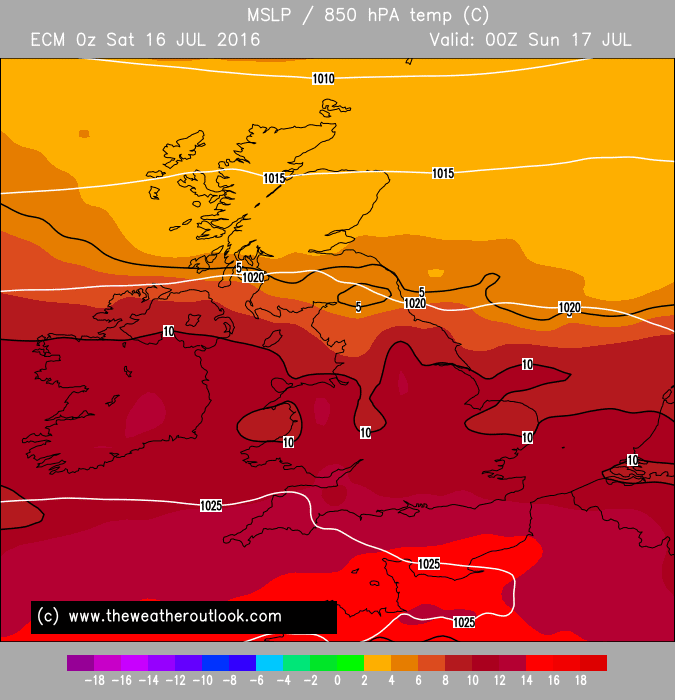 The warmth spreads north to scotland with 26/27c across eastern scotland. With this plume comes lots of sunshine but with isolated thunderstorms breaking out, the storms become more widespread midweek but gradually clear to the east by Thursday but I can safely say the best spell of the summer is coming and hopefully we will see more of it during the rest of this summer! 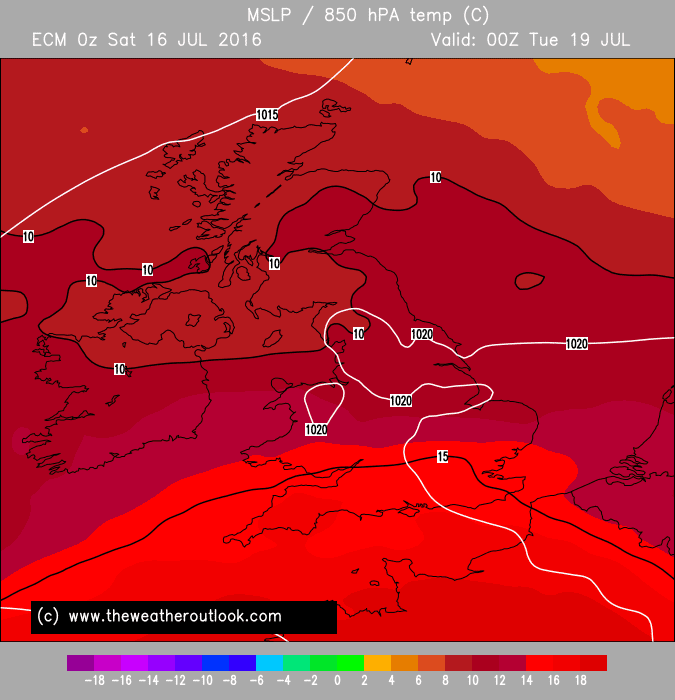 Net/Wx MR Model continues to show a 'hot' day Tuesday with temps possibly hitting 31c in some parts, And the chance of some big storms in the offering pushing North. Plenty of interest to keep tabs on over the next few days.. 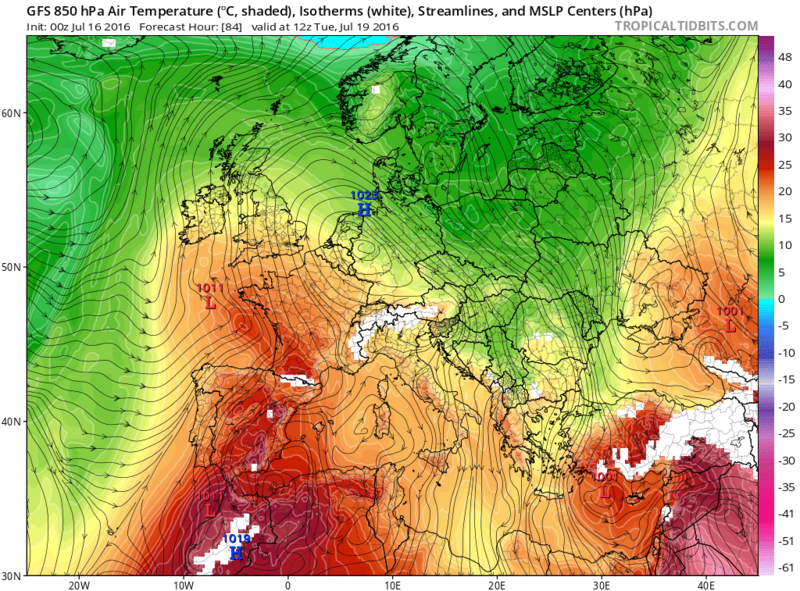 The Ecm 00z shows a lovely spanish plume next week, I think the south could reach 32c 90f on Tuesday and even Wednesday looks very warm / hot and humid. 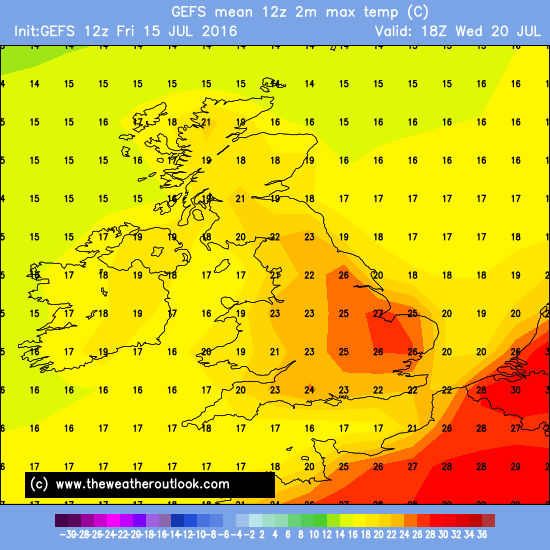 Fine with plenty of sunshine early next week but then come the thunderstorms and I expect the midweek period will be stormy but it's proper summer weather on the way..for those who said it wouldn't happen, guess what, it is! Edited July 16, 2016 by Karl. 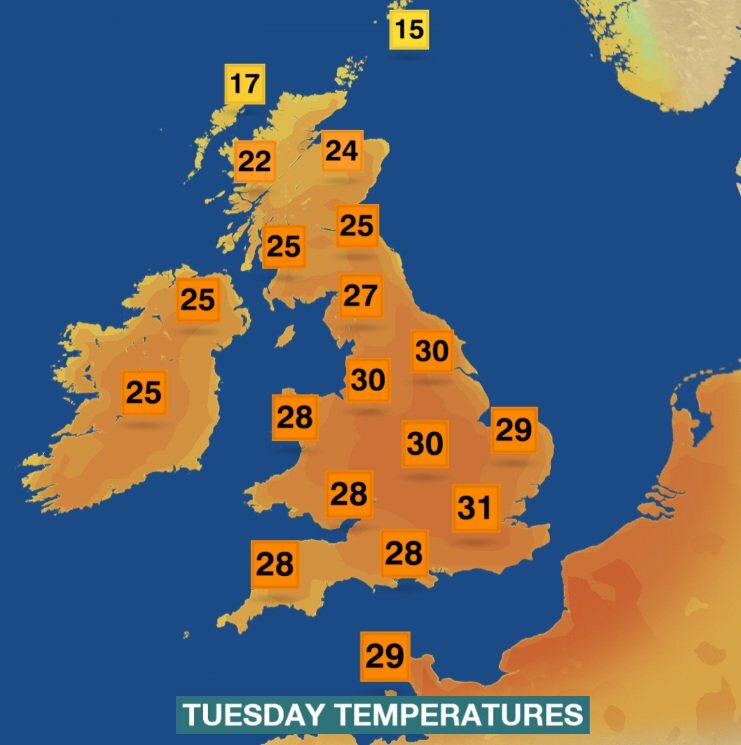 Tuesday certainly looks like being a cracker of a day, the thing that interests me is could we get another hot day out of this. Other models keep the high 850 temperatures well into Wednesday too, so it is ore a case of sunshine amounts and showers that could suppress temperatures. 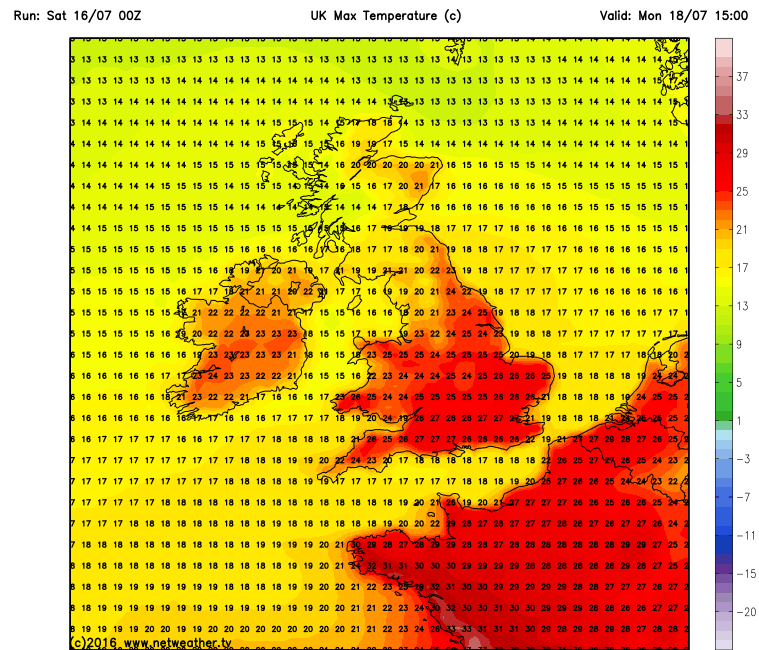 It would be worth saying that Monday is also looking like being a very warm day. 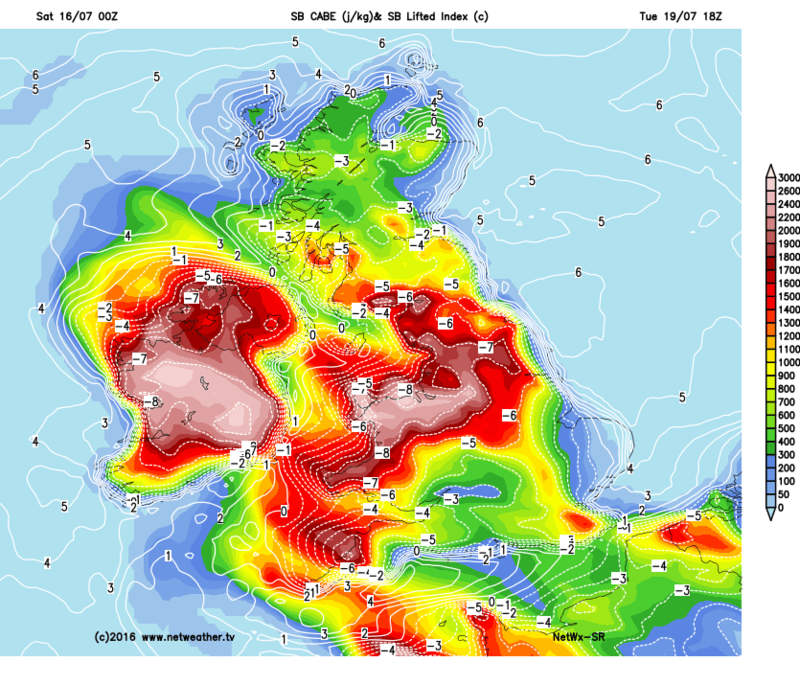 So the first half of the week looks very or to hot in the south and east, further north it is more of a one day thing (Tuesday), there is a risk of some pretty intense thunderstorms on both Tuesday and Wednesday to bear in mind as well. 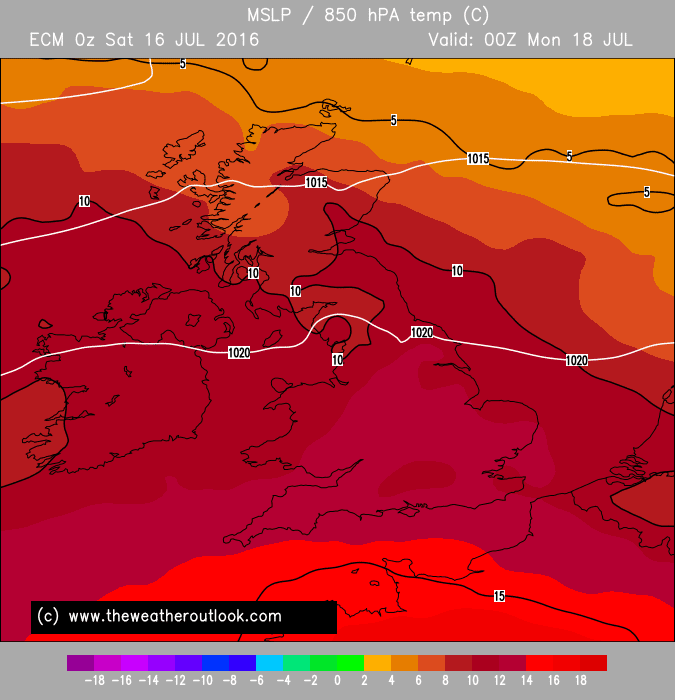 The ecm Tuesday 18z has max temps 28C in England possibly touching 30C in places with 24C in the north and 20C N. Scotland. 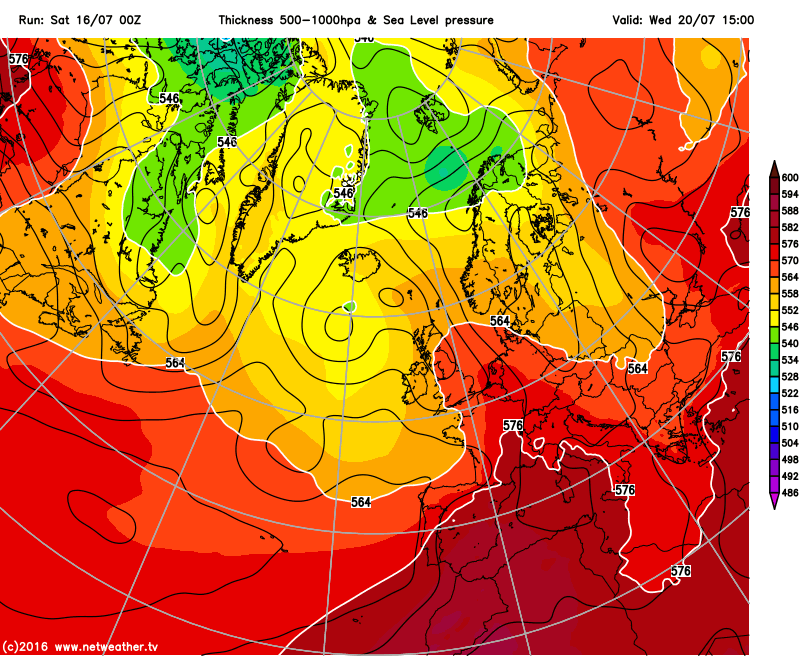 On Weds at the same time temps around 26C, possibly 28C in places, but restricted to SE of a line Humber to Bristol. 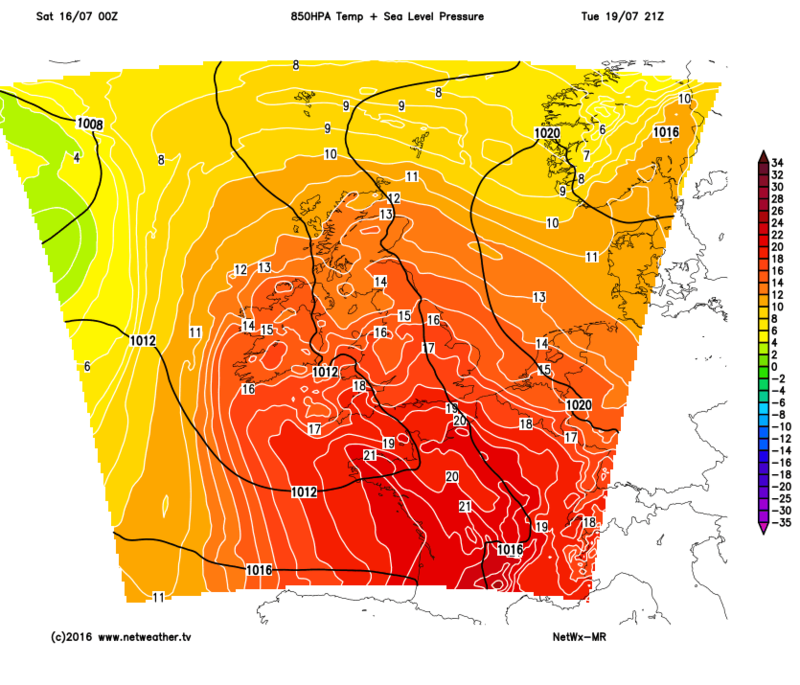 NW of that line much cooler and as low as 16C in N. Scotland. 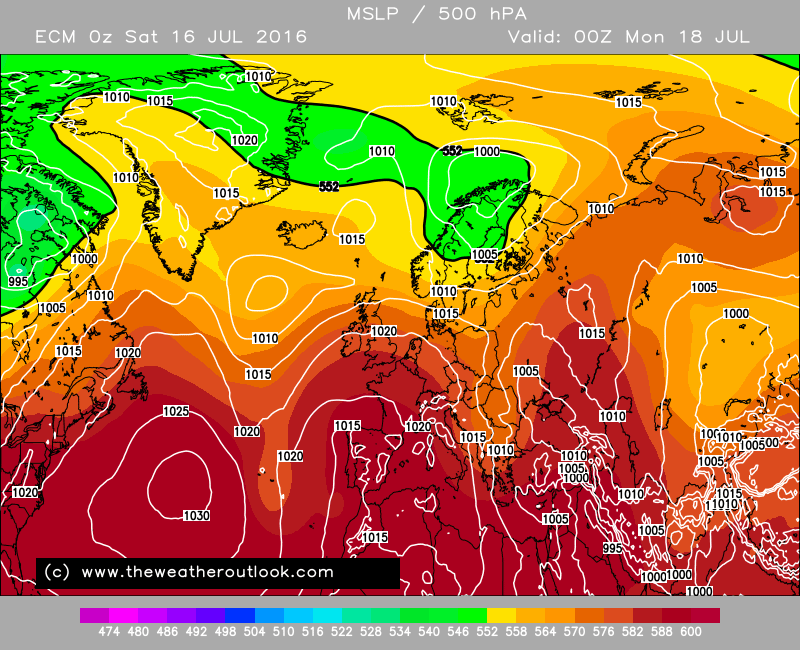 Temperatures down there modeled into the 40c's! It does look like a brief plume though as we see the cooler Atlantic air lurking in the wings out west. So a nationwide hot day. 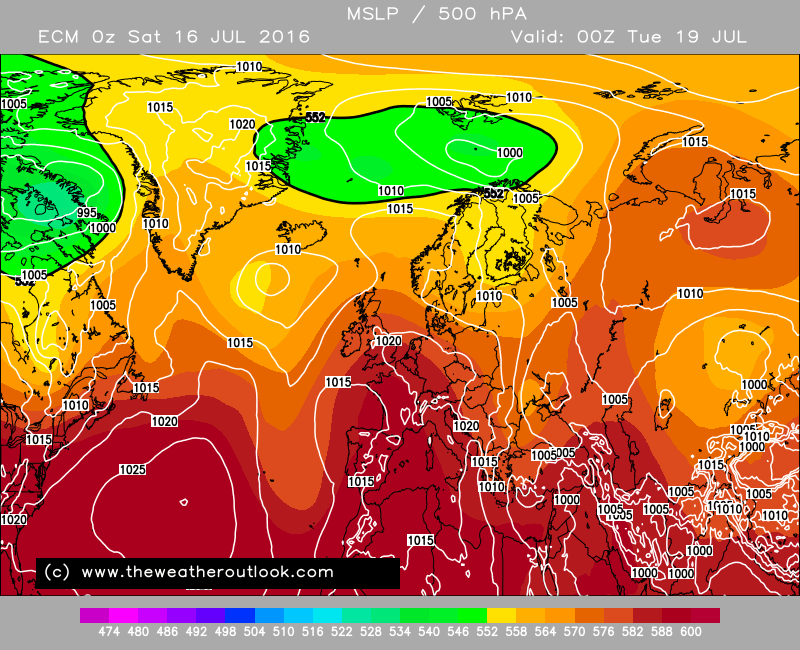 Shows how things can change quickly, even 48 hours ago many of us were writing off chances of heat for the north! 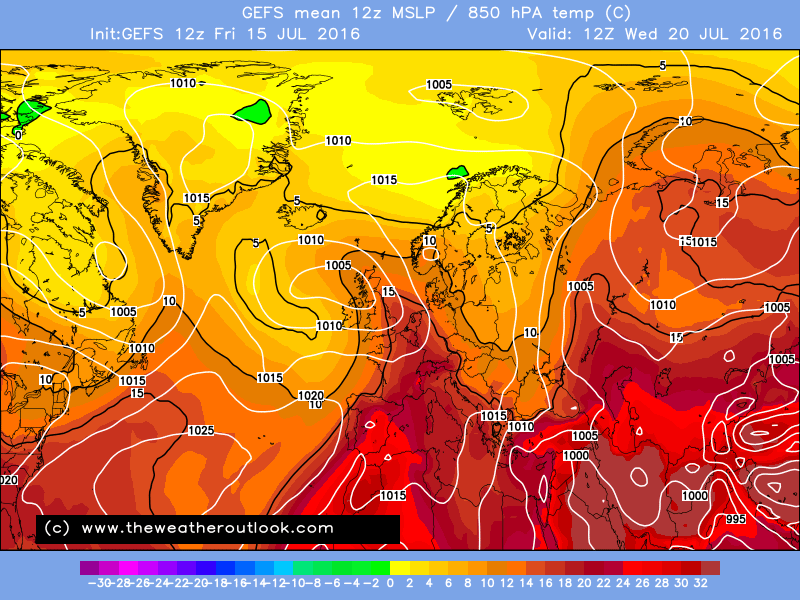 The GFS really is exceptionally hot - 18C 850s in place for a whole day over southern UK - a slight tweak could see 35C threatened on Wednesday - that would be the absolute ceiling for this situation, and I rather suspect that the GFS 00Z has slightly overdone things anyway. 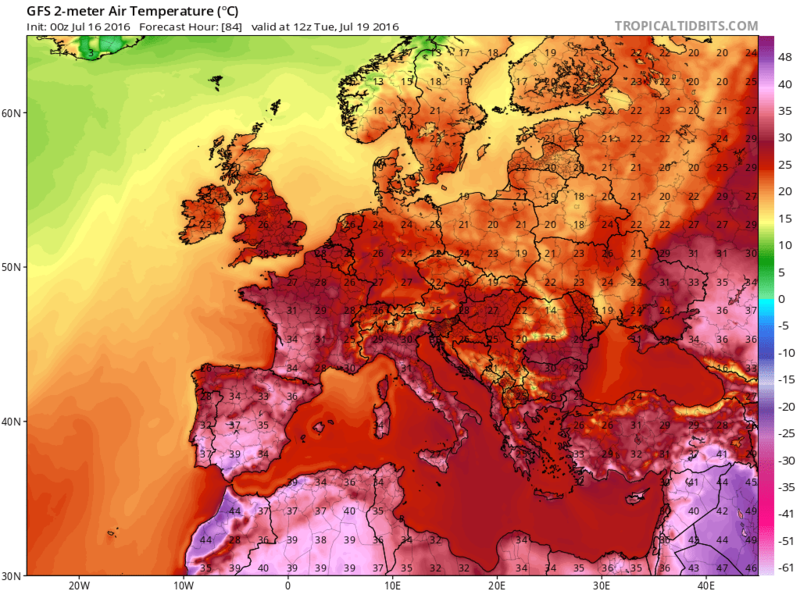 32C a more likely target. I wouldn't say that, starting from today we have 5 days of heat here. Yep agree down by your neck of the woods,enjoy it and the breakdown,should fingers crossed be good!! Further north by me i'd say 2days max then back down to average. And we won't get the light show i suspect you may get get. 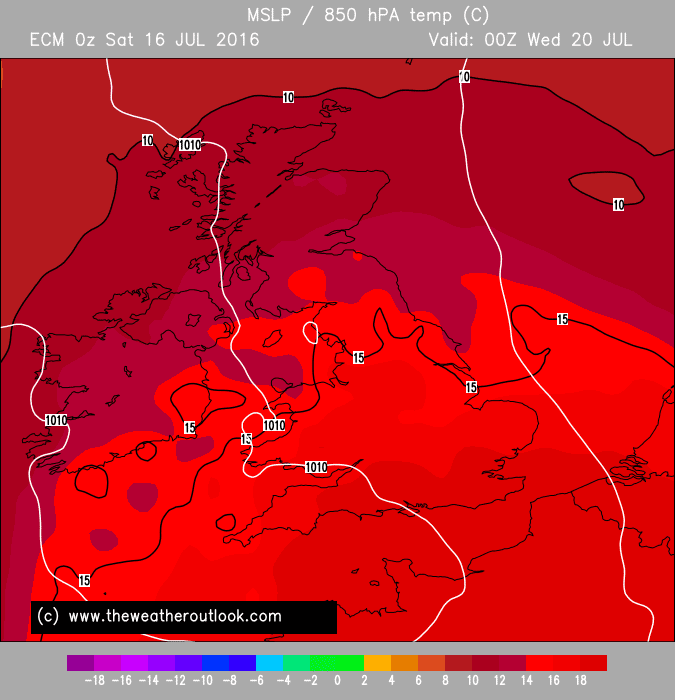 Just enjoy the heat and then the breakdown,you may get very lucky storm wise i suspect! 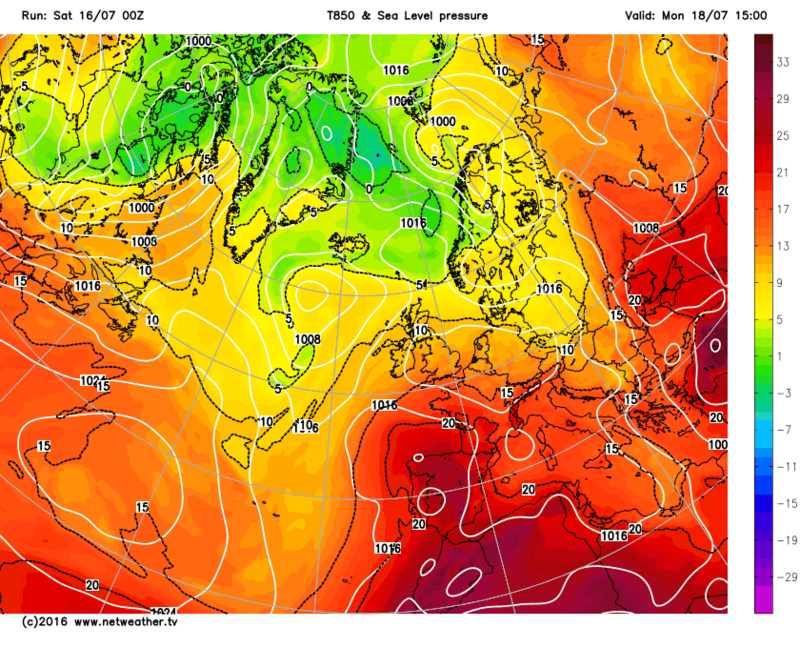 That gfs for Monday and Tuesday just keeps on getting hotter with each run, Now Wednesday seems to be shaping up to be another hot day. 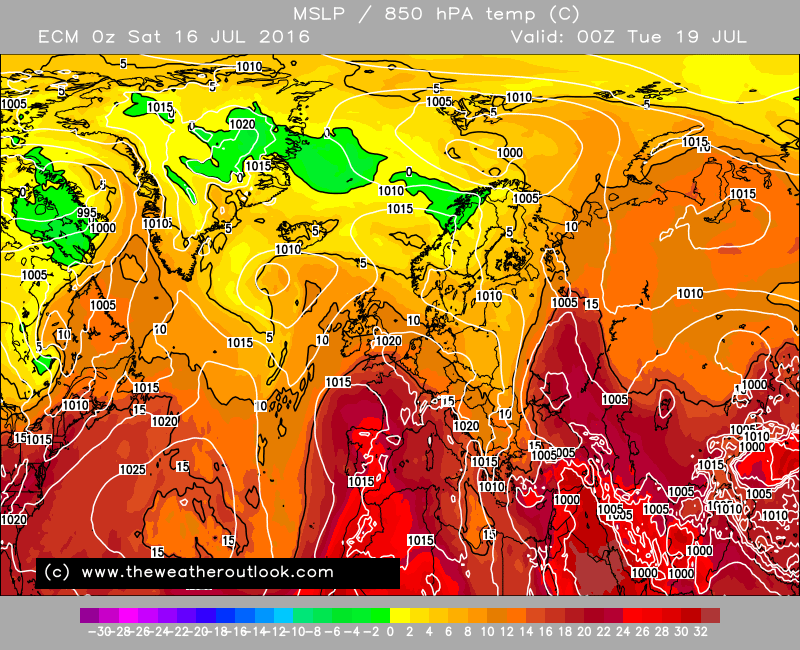 At this rate its possible that 34c might be touched in the South on Tuesday, with a good 30c elsewhere. 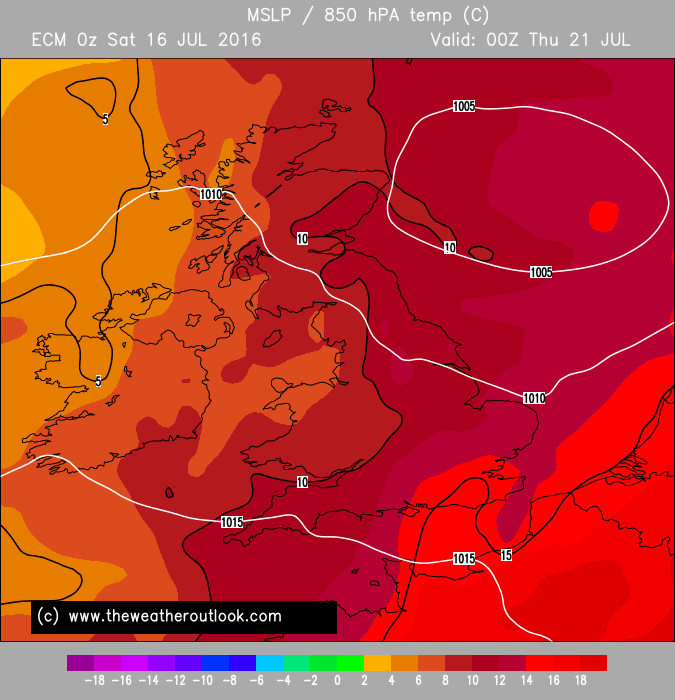 Bear in mind that four days before the 1st July 2015 we were only looking at 31c for that day.